AVAILABLE NOW at ARe, Smashwords, and Amazon ! 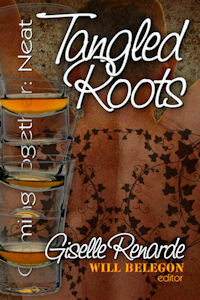 Giselle Renarde's Tangled Roots is a multilayered tale about Simone, who has come to a crossroads in her life. In order to move forward, she is going to have to chose more than just a path right or left... she is going to have to confront the heritage and the past that has caught up to her at last. Moses, the main male protagonist, is both what she wants and what she most fears. He will challenge both her assumptions and her misconceptions... and force her out of a comfort zone that has been holding her back in ways she has both cultivated and in areas of which she is completely unaware. The short length of this piece does not keep it from being a complex, well thought-out journey through Simone's past and her state of mind. It also addresses the subject of race and pride from an internal perspective, exploring how the outward assumptions of those around Simone shape her world and affect not only how she treats others, but her own sense of worth. A good read for a good cause; all Coming Together:Neat proceeds are used to fund micro-loans through Kiva. This work is also available through eXcessica, and if you think it sounds familiar, you might own it already.